New York Knicks Tickets on sale now! Sports Traveler has your New York Knicks tickets to the game! Purchase securely online in our real time inventory. Game tickets are available for all sections of the different stadiums. View our online inventory and purchase in real time. Do you want to visit Madison Square Garden and experience a New York Knicks game? Let Sports Traveler plan your entire trip! We can customize your very own tour package to include game tickets, hotel lodging in NYC, transportation, and even VIP options. Please tell us about the trip you would like to plan and let us take care of the rest! Nicknamed "The Worlds Most Famous Arena", Madison Square Garden is home to the New York Rangers of the NHL and the New York Knicks of the NBA. The present day "Garden" is the 4th arena to bear the name "MSG", with the original opening in 1879. 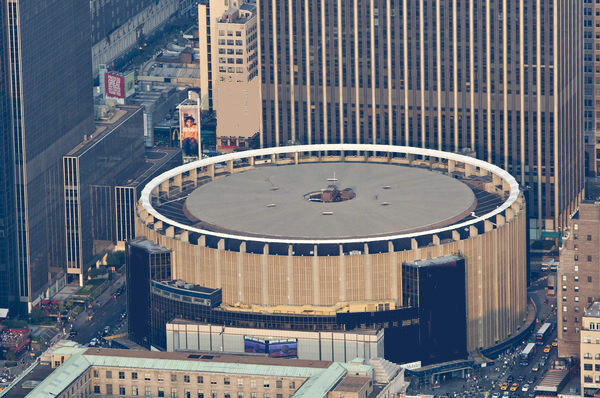 The present day MSG opened in 1968 and has since hosted 5 NBA Finals and 3 Stanley Cup Finals. Madison Square Garden is located on 7th Avenue between 31st and 33rd streets, and it is located above Pennsylvania Station, making transportation to the arena a breeze. MSG is truly one of the last great historic arenas remaining in the U.S. today. This is a must see for any sports fan traveling to the city of New York.